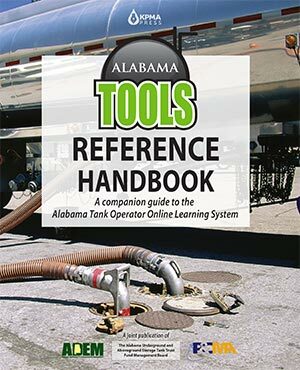 In 2014, the Alabama Underground and Aboveground Storage Tank Trust Fund Management Board approved a program by which tank owners and operators could receive on-going education related to UST/AST operations. This program, the Alabama Tank Operator Online Learning System is made up of printed, online and live educational sessions designed to provide tank owners and operators with a basic overview of UST/AST systems. This program DOES NOT replace Operator Training requirements for “A and B” tank operators but instead is intended to serve as “continuing education” for those involved in the daily operation of UST/AST systems. Order a copy of the book now!